Sacha Bois has been involved in Logistics for over 20 years. He has an excellent safety record as an inter-modal truck driver, limousine, taxi, and ride share driver. A small business owner, along with his wife, Dr. Karen Laljiani, he has managed LalBois Logistics, LLC for the past four and a half years. This year, LalBois Logistics has added the subsidiary company, Biggie Drones, to the portfolio of services offered. 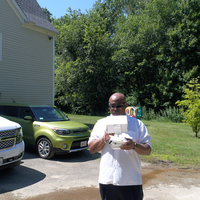 Flying a drone comes easy to this long term multi-vehicle driver. Certified level one drone pilots with the SkyEye network; FAA certified UAV pilot; and member of AMA (Academy of Model Aeronautics), Biggie Drones has the skills and network of professionals to support them in this new logistics initiative. Preferred types of jobs for this start-up subsidiary include roof inspections and real estate photography. Future interests include infrared photography for agriculture and sustainability monitoring.